Pothik Ghosh. The Deed of Words: Two Considerations on Politics of Literature. Delhi: Aakar. 2016. 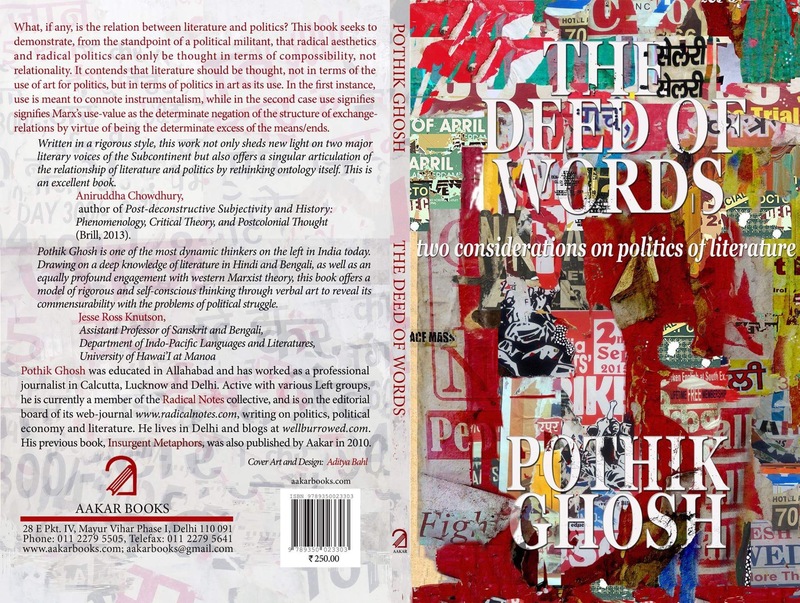 The two writers Pothik Ghosh brings together in his new book are distant enough from each other that most readers of the book will not have read them both. Gajanan Madhav Muktibodh is an important name in the history of 20th century Hindi literature, particularly for those with an interest in modernism or “aesthetics and politics”, but he is still a figure in Hindi modernism. Akhtaruzzaman Elias, a Bangladeshi writer, is more recent, perhaps slightly more obscure, and almost entirely untranslated. Even so, it would be a disservice to Muktibodh and Elias, not to mention to Ghosh, if I set about trying to summarize what the book has to say about them. Far more useful would be to ask: What allows for these two short monographs (for that is what they are) to constitute a coherent book (for that is what it is)? Ghosh compares neither Muktibodh and Elias, nor literature and politics, yet he writes of these things together. What, then, constitutes Ghosh’s comparative optic? Why these writers? Criteria of selection are always important. We will turn to Ghosh’s own remarks later and begin instead by invoking what I think is a revealing, if obvious, point of comparison with Alain Badiou. Jean-Jacques Lecercle notes that where Deleuze has an expansive range of references, Badiou works with a fairly small canon. (1) Deleuze’s desire for an immanent criticism is well-known; Lecercle shrewdly points out the trouble with a theorist making a claim to immanence and working with a diverse canon — does the spiel about immanence merely allow Deleuze to transform all these writers into more of the same? On the other hand, Badiou instrumentalizes the literature he chooses very visibly. But that is also why he chooses writers who are a good “fit”, writers who are, arguably, essential to his philosophy. Ghosh is akin to Badiou in this regard. At a moment where literary system building, and the hunt for a new sensitive literary criticism seem to constitute the organizing polarity in academic literary scholarship, Ghosh works with a different set of principles. The artist who designed the book’s cover narrates an incident: he walks into the publisher’s office and is confronted by an intellectual with a grave beard. The beard berates him for the excesses of the cover, excesses in what it does, and for its failure in doing what a book cover is supposed to do. The title doesn’t stand out clearly, nor does the name of the author. Why would anybody buy this? The artist, mildly irritated and unable to think of a suitable comeback, inquires under his breath if the beard has read Pothik Ghosh’s work. He had not, but he was right. The cover is cluttered, too bright in parts, not enough in others, with a preponderance of red. But it is appropriate for this book. Aditya Bahl’s cover works with an image familiar to those who have been students of the University of Delhi, such as himself, or me. The university has an institution it calls the “walls of democracy”, the only walls on campus where people are allowed to put posters — posters for the university students’ elections, teachers’ elections, pamphlets for demonstrations, rallies, marches, seminars and conferences, billets for sales, rentals etc. Any poster will last only a few hours before being plastered over by another. Often right-wing organizations will tear up posters put by leftists, and though leftists try to respond in kind, the right-wingers have far too much money and far too many posters to lose this battle. In any case, the most common sight of these walls is the one with which Bahl begins. Fragments of posters layered one upon another, bits of words in three languages, images in different colors that do not belong together. The fragments that Bahl captures were clearly meant to say something, but if this image says anything now, the burden of sense making lies entirely upon the one willing to wager on it. As this image images time, so Ghosh’s book, especially the chapter on Elias, tries to think it. What Ghosh finds essential to Elias’ work is the attempt to produce such images, which capture the present in its absences, an attempt, equally, to image pasts in their presentness. He explicates what this entails using Walter Benjamin’s conception of the allegorical (the Trauerspiel book) and his “Theses on the Philosophy of History”. For example, a rallying mob, short-circuiting moments that lie across the linear axis of time, invokes and brings into the present those who had rallied in the past. This passage is followed by a page-long catalog of “people from eras long gone by” who have joined the procession. Two maneuvers are made simultaneously: on the one hand, the passage highlights that what is visible in the present (i.e., what is present in the present moment) does not exhaust it, and in fact conceals a lot; on the other hand, what is invisible in the present gives us access to the presence of pasts hitherto unrealized precisely because in their respective presents, they were not entirely presenced. What Elias images in this fashion, Ghosh (as militant philosopher) must think in the allegorical mode (to be named by and by). His task is not description; to describe would be to allow thinking to be determined by the presents to which the posters, or the marchers, belong and the connections that history has already formed between them. To think, here, is to produce what Benjamin may have called a figure, a constellation, a palimpsest, a mosaic; it is to produce a momentary unity that has little to do with those presents, or with the desire to recover them. The term that Ghosh adds to the list above is the “command concept”, which wills into existence a future whose conditions of possibility it simultaneously produces by constellating the absences of the past. This past is made visible only by the future the concept wills, and that future’s substantiality depends on the past(s) so made visible. The concept that commands is Ghosh’s attempt to capture the complications of this future anteriority. The production of a command concept is a deed of the word. Which brings us to the type on the cover. The production of a figure (command concept) using the fragments one encounters is a difficult business, not least because it can only take the form of a wager. Its being lies in the claim that such a figure exists, and the claim is just a claim till the future that realizes it arrives. The wager lies in the fact that we carry on under the assumption that our action constitutes a deed of words, where it threatens to disappear in what it constellates, a deed of mere words. It threatens to become another layer, torn up or plastered over. It is this trait of the deed that Bahl tries to capture in the type, where the shadows in the font, on one hand, pretend to a solemnity that no work warrants, while on the other, it is these shadows that ensure that the title does not stand clearly against the background. At first glance, the title disappears into the cover; then you notice that what was making it disappear in this manner was also what tried to separate it from the background, declaring that it alone was the deed that constructed the image’s meaning. For very long, Marxists, Ghosh among them, have turned to the final sentences of Benjamin’s “The Work of Art in the Age of Mechanical Reproduction” to argue for the communist politicization of art, construed in either a Lukácsian or a Brechtian vein. In the book’s second chapter, “Literature in Use: The Muktibodh Alibi”, Ghosh begins by closing off this possibility: let us not speak of politicizing art. To explain his decision, Ghosh makes use of Muktibodh’s work. I will begin with those final sentences from Benjamin; my explanation too is in the spirit of Ghosh’s work. The aestheticization of politics lay in the “masses” being offered a merely symbolic resolution (expression) to material problems: the resolution of political problems using aesthetic means. The politicization of art, in a situation in which a political response in the domain of politics is required, is the same thing: political problems, aesthetic response. Starting somewhere here, Ghosh asserts a different principle for looking at the problem of aesthetics and politics, one which must allow for the autonomy of art vis-à-vis politics. Ghosh returns to that infamous slogan (which Benjamin too mentions in the aforementioned final paragraph of the aforementioned essay): l’art pour l’art. But Ghosh’s is “arguably, an attempt to resignify art for art’s sake as a proposal for revolutionary politics. For, insofar as revolutionary politics seeks to break with and decimate the structure of exchange and relationality, this is the only pertinent way to think the use of art and literature from its vantage-point” (Deed of Words, 70). The parallelism of politics and art, for Ghosh, is to be thought in terms of such “incarnation” of the “that which”. Ghosh’s favored way to denominate this is probably the phrase “real movement”, which Marx uses to define communism. (2) Uninterrupted unfolding is the essence of art as subtraction, as it is of politics; interruption produces art as a reified thing, as do institutions which limit politics. The end of the work is inevitable and demands another formulation, another moment, which is the moment of the writing of Ghosh’s book. (3) The window slamming shut can also be seen to symbolize this unavoidable reification of art, when it closes in upon itself and becomes a thing in the domain of value. At the end of the work (of art) how is another commencement to be imagined? Althusser, in his essay on Brecht, memorably quoted by a character in Godard’s La Chinoise, pictures this next moment: “I look back, and I am suddenly and irresistibly assailed by the question: are not these few pages, in their maladroit and groping way, simply that unfamiliar play El Nost Milan, performed on a June evening, pursuing in me its incomplete meaning, searching in me, despite myself, now that all the actors and sets have been cleared away, for the advent of its silent discourse?” (For Marx, 151). In his preface, Ghosh writes that Muktibodh and elias are only pretexts for him. But it is not difficult to glean that what is actually at stake here is a well-concealed methodological maneuver that he is hesitant to own up to. This maneuver concerns the idea of “mediation”, both a stumbling block and raison d’être for much Marxist literary criticism. The work is seen by such criticism as the yoking together, or an articulated totality, of different levels of abstractions (layers), such that, in tracing them, one can traverse the distance from the deepest/furthest to the most accessible. These layers can be denominated in multiple ways (the unconscious and history are two common names for the deepest/furthest). The “ideal type” of (a certain kind of) Marxist literary criticism would navigate each mediating level and be a complete map of the work, as it were, hopefully without being the work. So, for instance, criticism could begin by “close reading” a few passages of a work, slowly account for style, proceed to historicizing the form or the “content of the form”, and finally arrive at an understanding of the work that fits without violently reducing or transforming it. But even the map of the work which is the work is infinitely different from the work (as we have learnt from Pierre Menard, autor del Quijote). Ghosh is clear-sighted about this, which is probably why his work is unlikely to get the attention it deserves from academic Marxists, or from Marxists who happen to be academics. He uses the idea of the “wager” to posit an image of thought in which its commencement and its recommencement is constituted of leaps; transitions are undetermined in relations to all things except the labor of thought. Mediations are chromatic steps introduced to make the jumps seem smaller, but no matter how small an interval may seem, the before and the after are entirely different, i.e., unmediated. There can be no satisfying accounts of mediations, because this is the name given to that which is not accounted for. Schematically: The passage begins with a quote in Hindi, or Bengali, which Ghosh translates, and then his commentary. The more acceptable mode is one in which the critic’s commentary begins with a brief summarizing gesture, even a careful paraphrase, and the contextualizing operation that follows segues into the theoretical language particular to the critic. As I see it, the reason Ghosh does not follow this protocol is part indiscipline, part decision. Indiscipline insofar as he has not spent years in the disciplining apparatus of a literature department and does not have to deal with the anxiety of publishing in peer-reviewed journals etc. Not conditioned by this particular anxiety, he approaches his writing as a moment in his thinking process, a moment in which it is externalized so that it can allow thinking to recommence. It has no need to be a final product and it is this that makes for a hermetic style that readers, including academics, have been impatient with over the years. We must note, of course, that he has his readers, who continue to read his work because they too are part of this process of thinking, though thinking is not their business. A decision because it is a direct consequence of Ghosh’s conception of thinking’s unfolding as uninterrupted becoming-other; this is what dialectical unfolding is for him. Another way to put this would be to say he takes Benjamin’s sketching out of the task of the translator very seriously — translation is precisely a kind of recommencement in another language, not making a work available in another language, but making another language available to the work. The attempt to lay out mediations, the fantasy of close reading, and the attempt in the writing of a critical essay to mediate the movement from the text to the theorization are, in Ghosh’s view, all illusions, things that get in the way of thinking. His enterprise is to think under the condition of a work and he feels no need to hide the leap from the quote to his own thinking, and may even want to highlight it. If one were to read the passage quoted above without a familiarity with not just Badiou’s thought but Ghosh’s version of his thought, one is likely to feel frustrated. And yet, if Ghosh’s method is unapologetically bold, his explication of it, to return to the beginning of this section, is modest. So to modify the question with which Ghosh opens the second chapter of the book: why should ambition hide behind modesty? Why, instead of claiming this conception of thinking (in the condition of art/literature), does Ghosh stage it as partial failure? Does he not identify entirely with this image, or is he surrendering himself to the affectations of his academic readership, ducking his own call for an “academics beyond the academia”? This is by no means the most trying bit of his prose, but it demonstrates what needs to be demonstrated. This is Ghosh’s attempt to grasp dialectical reason dialectically, at the same time as he grasps analytical reason dialectically. They must be grasped together, in order to be grasped dialectically, because they together constitute the dialectic that has to be grasped. The final clause of the first sentence “to actualize it”, contains the second moment of the dialectic, the first moment being analytical reason’s overcoming of itself. It is this final clause that pushes the sentence to a point where very few readers would patiently be willing to follow it; in the process, it takes its toll on syntax too. And there is indeed risk of repetition — for by this point Ghosh has already stated this formulation in at least three other different ways. The “dialectical sentence”, one that is not merely chiasmic, containing a “thesis and antithesis” (from the rock-ribbed triad that is often mistaken for the dialectic), but one that holds three moments of time — the beginning with two, the moment without duration that is sublation, and the appearance of another two, is a strange fantasy. It requires elaborate use of “suspended syntax”, not unlike the first sentence of Paradise Lost, and is responsible for much of the difficulty of Ghosh’s style. And what is gained even if one does succeed in producing such an unlikely sentence? The moment the dialectic is represented, it demands immediate restatement against the grain of the first representation. If in the first instance sublation has no duration, becoming a vanishing mediator, in the second and third instances the initial and the final must respectively play the same role. In the first place then, there is the excessively knotted sentence, and then repetition. The political problem hides in this stylistic issue. Even Hegel — for whom God as Absolute Spirit was the totality of Father, Son, and Spirit, the process by which each leads to the other — willingly paused with the Trinity as a commonsense representation of this process. Fredric Jameson points out in The Hegel Variations that, at the end of the Phenomenology, Reason does not destroy commonsense and picture-thinking — they have to continue to exist; reification cannot be sidestepped, and it never disappears. The search for the sentence that captures dialectical unfolding without pause reflects a distaste, even a fear of representation, which is the same thing as the fear of reification. Ghosh’s most breathless passages are the ones which contain the essence of his argument. Since these arguments tend to be “dialectical”, their being arguments depends upon a fundamental asymmetry in the dialectic: if one side of the dialectic is not heavier we are left moving around in circles. Fearing the institutionalization of such asymmetry, an asymmetry essential to the polemical import of the arguments, Ghosh immediately tries to balance them out. The struggle with syntax and repetition are recognized pitfalls of writing dialectically but the fear of reification threatens to push the dialectic back to a properly idealist moment. This fear, which whether unwillingly or otherwise becomes a significant organizing factor in Ghosh’s prose, undermines the centrality that the wager (and courage — as opposed to anxiety — to put into play Alain Badiou’s binary from Theory of the Subject, which Ghosh would no doubt appreciate) has for his thought. The appearance of this anxiety in his style may well be an important repressed of his theorization. Something remains to be said about that. (1) See the second chapter, “A question of style”, in Jean-Jacques Lecerle’s Badiou and Deleuze Read Literature. (2) Badiou’s conception of the “Event” and the four domains (politics, art, science, and love) in which it takes place could also be evoked to explicate this. (3) Ghosh discusses this with reference to Muktibodh’s “Ek lambi kavita ka ant” (“End of a Long Poem”). Althusser, Louis. For Marx. New York: Verso. 2005. Benjamin, Walter. Illuminations. New York: Schocken. 2007. Ghosh, Pothik. The Deed of Words: Two Considerations on Politics of Literature. Delhi: Aakar. 2016. Lecercle, Jean-Jacques. Badiou and Deleuze read literature. Edinburgh: Edinburgh University Press. 2010.